Markington Hall, North Yorkshire, collection of Margaret Mary Clara (née Wilberforce), Lady Illingworth (1900-1986). 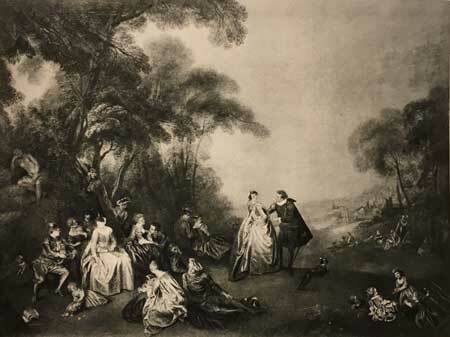 Her sale and others, London, Christie’s, November 29, 1990, lot 311: “Manner of Antoine Watteau, / A Fête Galante / 30x38in. (96.2 x 96.5cm.) / £2,000-3,000.” Bought in. Ingersoll-Smouse, Pater (1928), cat. 235-36. Vogtherr, Französische Gemälde (2011), cat. At present, this painting is known only through its two appearances at auction at Christie’s, first in 1990 and then again in 1992. 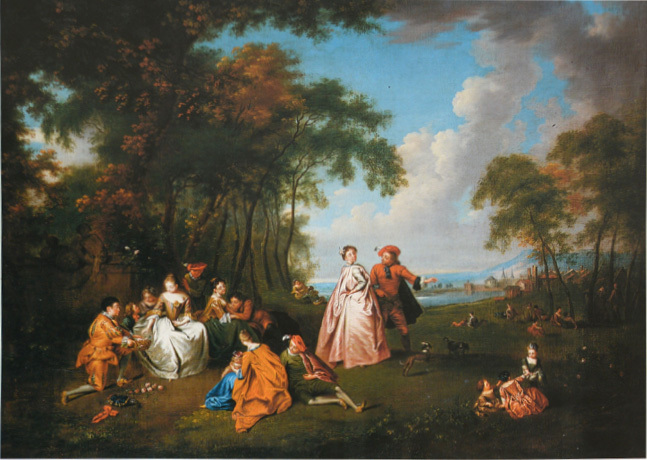 In listing the painting, the auction house changed the phrasing of the attribution slightly: from “manner of Watteau“ to “follower of Watteau.” But whatever the nuanced difference was supposed to convey matters little since the composition is wholly related to Pater, and has nothing to do with Watteau. Jean-Baptiste Pater, La Danse, oil on canvas, 130.2 x 192.8 cm. Potsdam, Sanssouci. 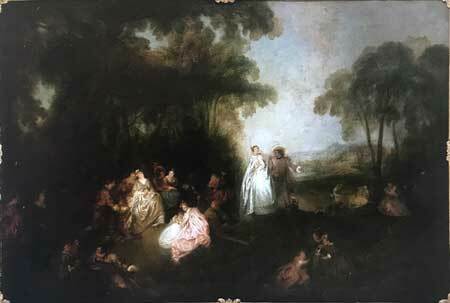 Jean-Baptiste Pater, La Danse, oil on canvas, 86.5 x 105 cm. Whereabouts unknown. Lady Illingworth’s painting is closely related to a Pater composition known through two splendid examples, one that is in Schloss Sanssouci and the other that almost a century ago was in the collection of Baron Lambert, Brussels. All three have essentially the same composition: a mass of seated figures at the left, a standing man and woman to the right of center, and children in the right foreground. The individual figures vary slightly from one painting to the next. For example, the standing couple at the center of Lady Ilingworth's painting is closer in pose to that in the Sanssouci version, and the children in all three versions are different. But such differences are common in Pater’s paintings, for although he frequently painted several versions of each of his compositions, he generally introduced such variations. Although I know the Illingworth painting only from the reproduced image, it looks as though it may indeed be an autograph work. It should be noted that there are substantial discrepancies between the measurements recorded in 1990 and 1992. It is hoped that the latter set of measurements is correct.